We are a small, family kennel located in Lewiston, South Australia. We are committed to breeding Deerhounds of sound structure and temperament that can take their place in a caring household. This is not a breed for everyone and raising a Deerhound puppy can be a lot of work. The rewards are however immense and the right investment of care, time and energy will be returned to you tenfold. We are happy to explain our expectations of owners and the requirements for adequate care and housing. 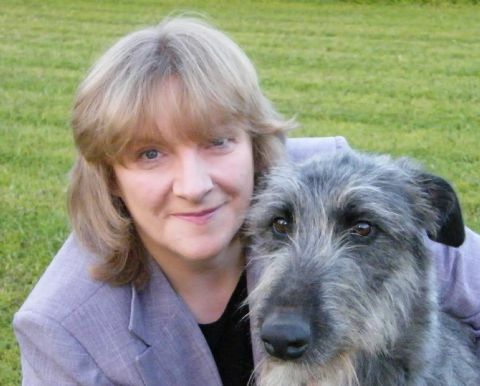 We are members of the Deerhound Club of Victoria and life members of The Deerhound Club in the UK. Having previously bred and exhibited Newfoundlands, Anduril was established in 1991. Although we maintain a strong interest and life membership of the Newfoundland Club in SA our hearts are owned by our Scottish Deerhounds. We are grateful to our puppy owners around the country who regularly keep in touch with photos and progress updates. The star girl of the kennel is Grand Champion Anduril Ravenscraig (Raven) who is owned and professionally handled by Melanie Buckley of Fyrth Kennels in the ACT. 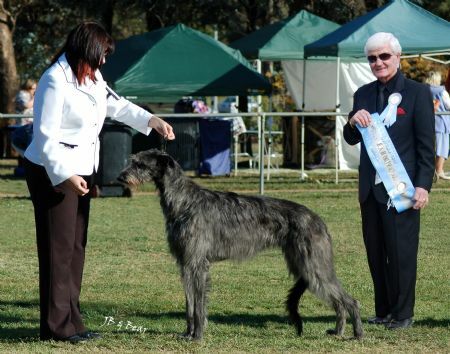 Raven is a Best in Specialty Show winner sired by the most awarded Deerhound of all time in Australia, Supreme Champion Bhealaich Gotta Luv Me (Scrappy) also owned by Mel Buckley of Fyrth Kennels. With a number of in Group/In Show awards Raven is one of Anduril's most successful home bred Deerhounds. Our sincere thanks to Mel (and Scrappy!) for guiding Raven to this wonderful result.